I thought that the Online Summer Card Camp with Jennifer McGuire and Kristina Werner sounded like a fun idea, so I signed up. I am always keen to see and learn new techniques and tricks. Week 1 has the following colour combination. I find colour challenges the hardest as I don’t like to be limited to a set amount of colours, but alas I have produced something! And what is even more exciting is that I am using my new Jane’s Doodles Garden Friends stamp set which arrived at my door this week. 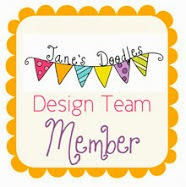 I have always been a fan of Jane’s cute little digital images…and now I have heaps of cute stamps to play with…oh, and I am the biggest fan of her buttons too! A close up of the flowers which I raised up to give the card some dimension. Thanks for stopping by and why not click on over to Jill Foster’s blog as I am the featured artist this week! Just popping in with some VERY exciting news that I have been sitting on for a little while. I am this week’s featured artist on Jill Foster’s blog “Inspired by…”! I still can’t believe that Jill asked me!! I don’t think you have been able to wipe the smile off my face for the last week. So pop on over to her blog and check out what card of mine has inspired Jill….and see her FABULOUS work! She is definitely one talented stamper who is not afraid to use colours boldly! Love her work! !